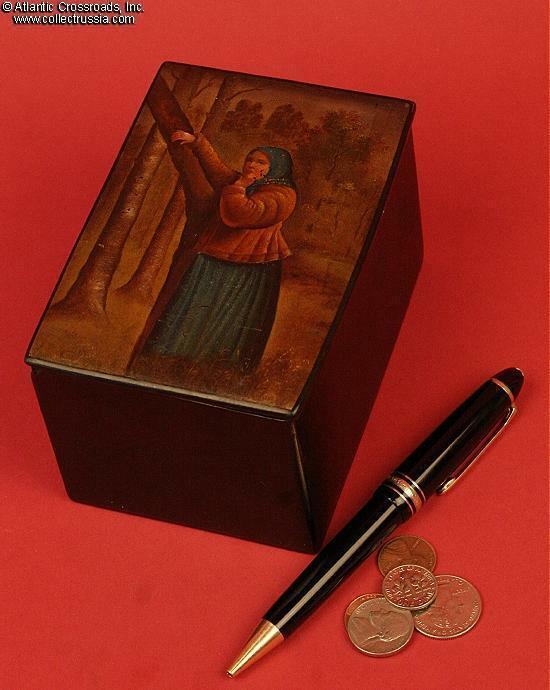 Lacquer tea caddy probably from either the Vishnyakov or the Lukutin workshops in the Fedoskino region. 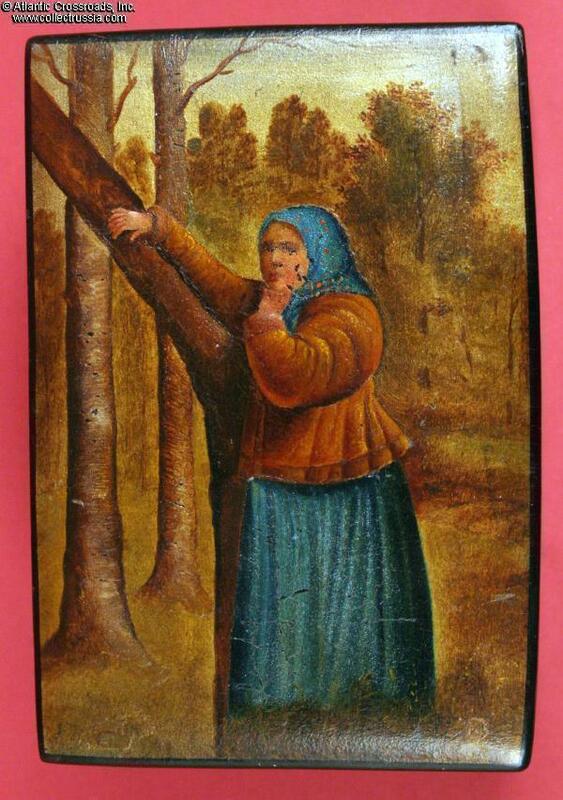 Lacquer tea caddy probably from either the Vishnyakov or the Lukutin workshops in the Fedoskino region. Circa 1900. 3 ½" x 3 1/8" x 5 ¼". No trademark remains but one can see what appears to be the remnants of a "Made in Russia" inscription on the bottom. 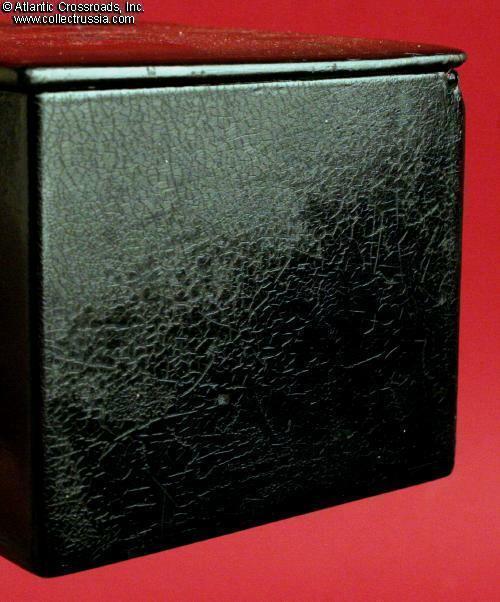 Unlike all of the modern lacquer boxes that we have seen, this has an interesting extra inside lip on the lid to protect the contents. Traditional red painted interior. Vestiges of an early paper lining. Very good condition. Light aligatoring on all of the black surfaces which does not detract. 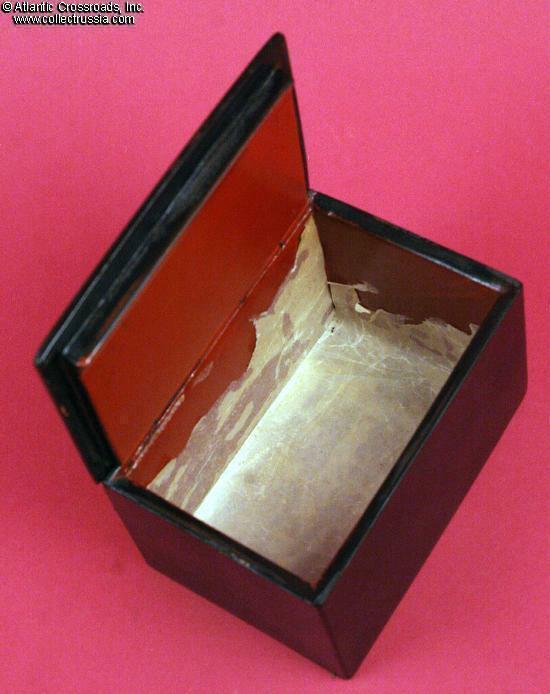 While the interior was originally painted the traditional red, an early owner decided to line the bottom and the sides of the box with a parchment-like paper, vestiges of which are still visible. From observing paper lining done to other antique boxes, we imagine that this was done in an effort to "upgrade" the box. 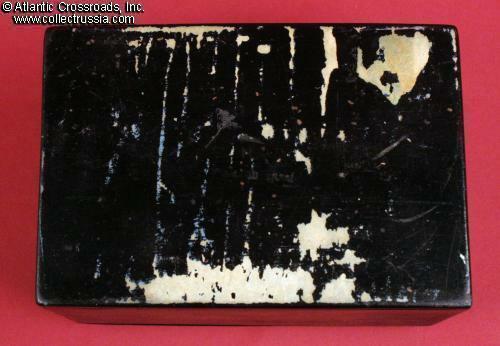 It seems that a rectangle of identical paper was also probably once carefully attached to the bottom (in much the same way that people today buy and apply felt to the bottoms of lamps, bookends, and small sculptures) The painting on the lid had seen wear but is still very presentable and the fact that it has not significantly darkened over the decades is a definite plus. 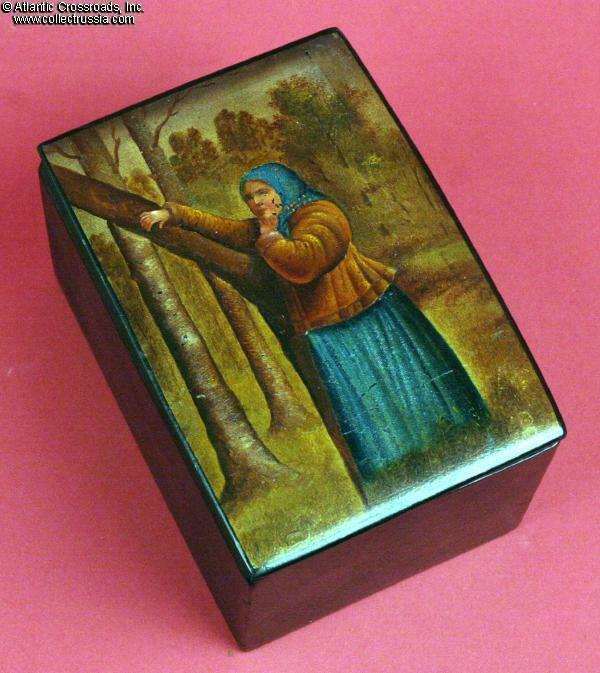 Next to views of troikas galloping across the countryside, scenes of peasant life were always popular on lacquer boxes, plates, and other artifacts. Individual paintings of young women either hard at work or "lost in reverie" were popular both at home and in foreign stores.